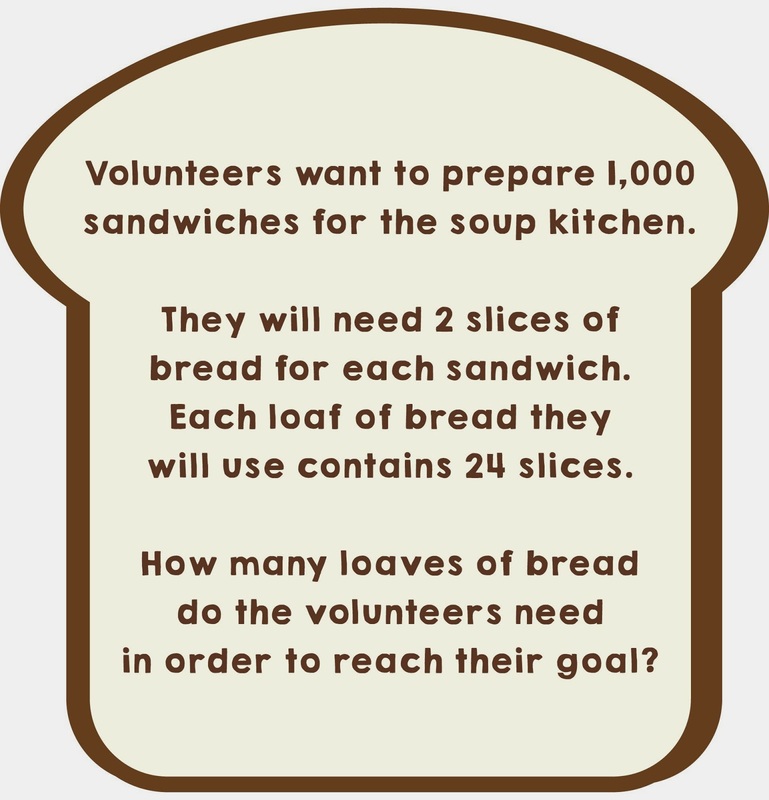 Do the Math: Volunteering Adds Up! It's seems like so long ago that Volunteer Odyssey introduced us to St. Mary's Soup Kitchen. The first time I walked into the soup kitchen, I remember thinking that it would likely be the ONLY time I ever volunteered there. Was I ever wrong! It's a funny little story, actually. Since then, St. Mary's has become like home- the people like family. This week marks 34 consecutive weeks that Janie Kathryn and I have volunteered for our Tuesday shift. That's 34 Tuesdays of waking up before the sun, through the hottest weeks of summer and into the coldest of winter. I mention this not to pat myself on the back, but because it's a testament to how much it means to my child and to me to have the opportunity to be there every week. It's an activity that homeschooling affords us and one that engages my child's brain as well as her heart. 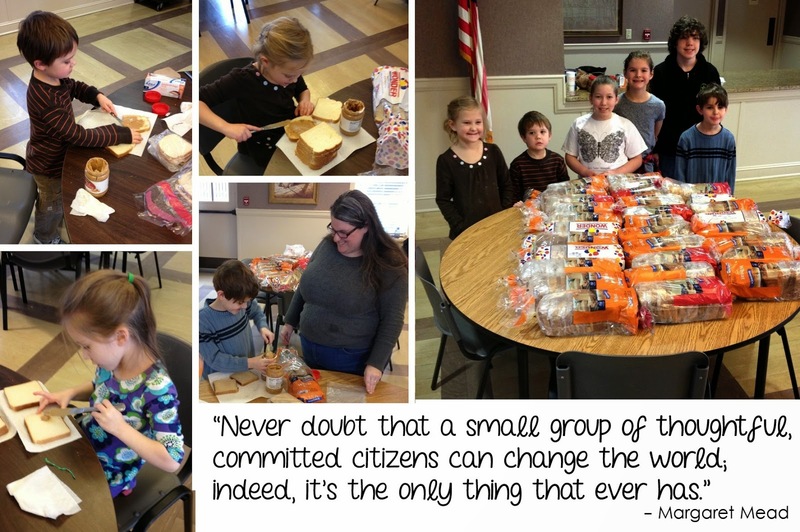 There was absolutely no way that we could participate in a month of service projects with other homeschoolers and NOT serve at St. Mary's Soup Kitchen. It would be like asking your friends to come over and not inviting them inside! I knew it might be a stretch to expect a group of youth volunteers to make it downtown by 7:15am, so I inquired about how we might help after-hours. The project: making peanut butter sandwiches and touring the soup kitchen. The sign-up slots filled up almost instantly. How exciting that so many people wanted to come to the soup kitchen- our soup kitchen! We assembled, 9 kids and 5 moms, and made short work of a sandwich-making session. Everyone brought loaves of bread (30 in all) and together we prepared 360 sandwiches. And yes, we did the math together. 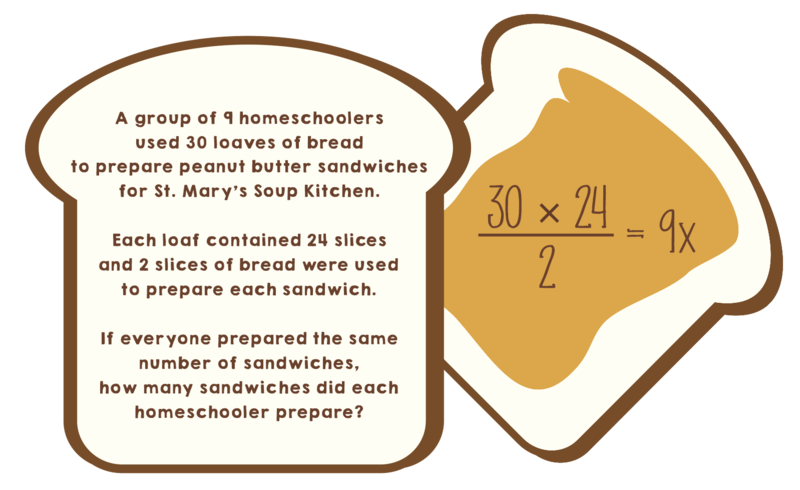 It varies by ability, but you might be surprised how much math you can work into making sandwiches. 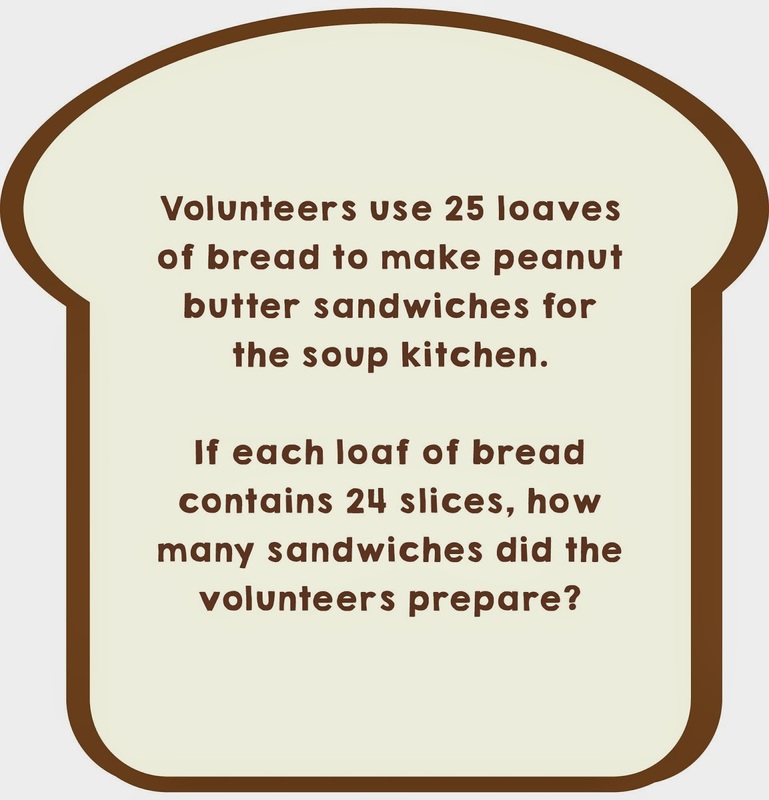 You can actually practice a lot of skills while volunteering at the soup kitchen, but math was not the learning objective of our Month of Service Learning. This group was focused on addressing hunger and homelessness in our community. During their time at St. Mary's the Service Learners contemplated the challenges of making healthy food choices when eating to ease the pain of hunger. We also considered the fact that people who are experiencing hunger (or food insecurity) are not necessarily homeless. One of my 8 year old friends was quite perplexed by the idea that a parent can work hard at multiple jobs, have a home and a car, and still not have enough money to keep food on the table for the entire family. We walked through the steps of a volunteer shift at the soup kitchen. The tower of soup was most impressive, while the early morning hours were less appealing. So, of course we talked about other ways to be involved! Sign up through Volunteer Spot on the soup kitchen's web page. Be sure to take note of the address, so you show up at the right place- a little reference to my first time serving! You can sign up to receive newsletters and stay up-to-date on events and opportunities for getting involved at the soup kitchen. You can also follow St. Mary's on facebook. 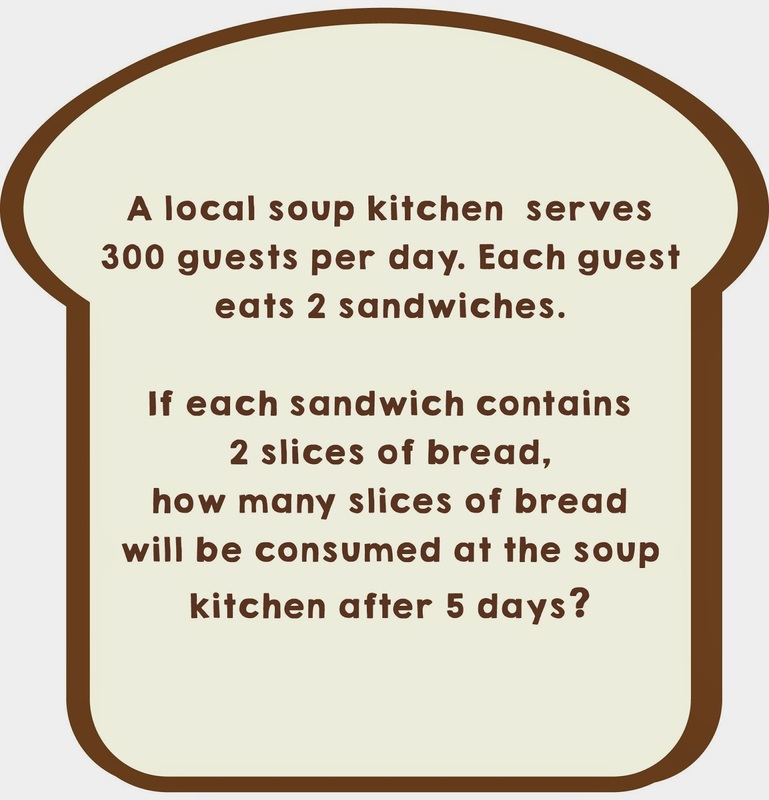 Now, how about a little soup kitchen math? Job loss, medical bills, unanticipated debt! A hurricane, a tornado, an earthquake! A fire, a crime, an illness or addiction! Living in poverty or close to the poverty line! And sometimes not so close. This is a list of some of the answers to a question the Service Learners have been pondering. What could cause a FAMILY to become homeless? If you've been following our Martin Luther King, Jr. Month of Service Learning, you know that our month-long service project is focused on addressing homelessness in our community. As we've learned more and more about what it means to be without a home, we've also dispelled some of the common misconceptions surrounding homelessness and discussed the differences between chronic homelessness and temporary homelessness. A homeless person does not always look like the mental picture we may have of a man sleeping under newspapers, on a park bench. According to Sister Maureen Griner, Founder and Director of The Dorothy Day House of Hospitality, at this very moment in Memphis, a family experiencing temporary homelessness is living in their car. This is a fact that many adults don't know and one that blew the minds of the kids who volunteered to provide dinner for the residents of Dorothy Day House. We gathered together to prepare a baked potato bar. A group of 8 volunteers washed and wrapped potatoes and prepped all the toppings. While we worked, we learned that the Dorothy Day House of Hospitality provides housing and support to Memphis families who are experiencing temporary homelessness. We talked about the causes of temporary homelessness (listed above) and considered how our own lives might be changed by any one of those situations. Then, I asked them a question. "What do you think I would do if I were temporarily homeless?" Though no one offered the correct answer, all of the suggestions were very logical and informed guesses. If I personally lost my home due to a traumatic event or natural disaster, personal tragedy or financial burden, I'd call my mama! It seemed so obvious to them- the idea of calling mom- and yet so inconceivable that grown-ups might still need their parents. It was as obvious and inconceivable as the idea that, during tough times, many people lack the support of family and friends. This! This is why we prepared a meal. This is why we sat down to dinner with families we just met. This is why we learned that serving The Dorothy Day House of Hospitality helps families stay together during hard times. No matter how people (families) come into homelessness, they need support to overcome it. Sometimes that support comes from a different kind of family- a caring community. People who don't know about Dorothy Day House don't yet know that they want to help. I've said it before and I'll say it again! 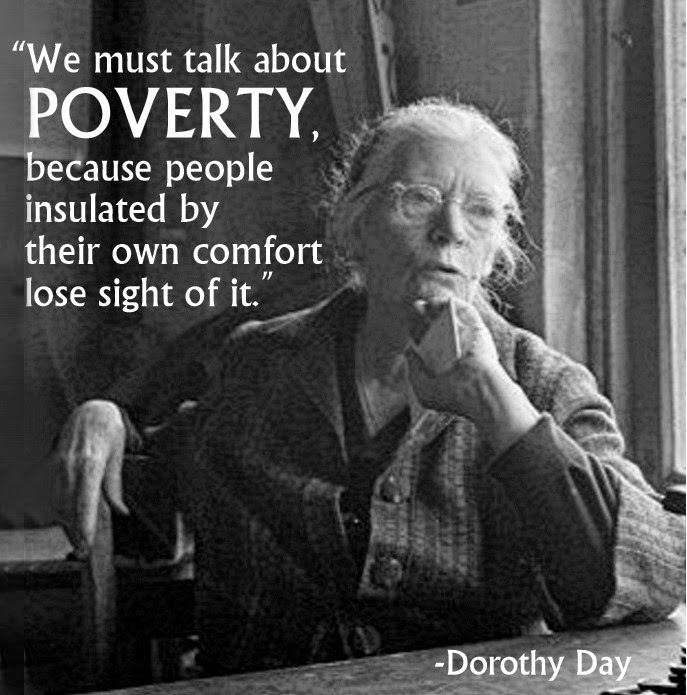 One of the easiest ways you can help organizations like Dorothy Day House is by telling others. 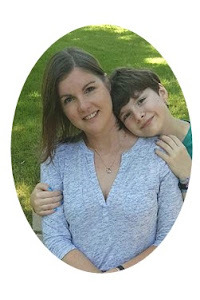 My friend, Lauren Squires, recently wrote, "Social media is now a tool of empowerment." She is so, so right! It seems trivial, but liking, pinning, sharing, and tweeting can garner more attention and even support for non-profit organizations like Dorothy Day House. Click here to get started. Individuals and groups can sign up to provide Monday Night Meals at Dorothy Day House. From house maintenance to moving furniture, sorting donations to assisting with fundraisers, there are a variety of ways to share your talents and get involved. Click here to find out about volunteering. Of course, you can give a monetary donation. You might also consider an in-kind donation. Items like toilet paper, tissues, paper towels, napkins, dish and laundry detergent, cleaning products, and garbage bags are always needed. The next time you're cleaning out the toy box, closet, or linens, consider contacting Dorothy Day House to see what they can use! We enjoyed another successful session, serving Room in the Inn (RITI) at Trinity United Methodist Church. Trinity's pastor, Reverend Debora Christiansen- or "Rev Deb" according to her friends- took a moment to speak to us about the guests who would sleep in the beds we were preparing. She also shared with us how she was introduced to RITI, through another Memphis church. Another Room in the Inn?! Rev Deb's words led into a powerful discussion and some really great questions from these young volunteers. "What if there are lots of volunteers, but not enough locations?" We learned that Room in the Inn is not one place that serves one night a week. Rather, it is an initiative that can happen in many locations, any night of the week. 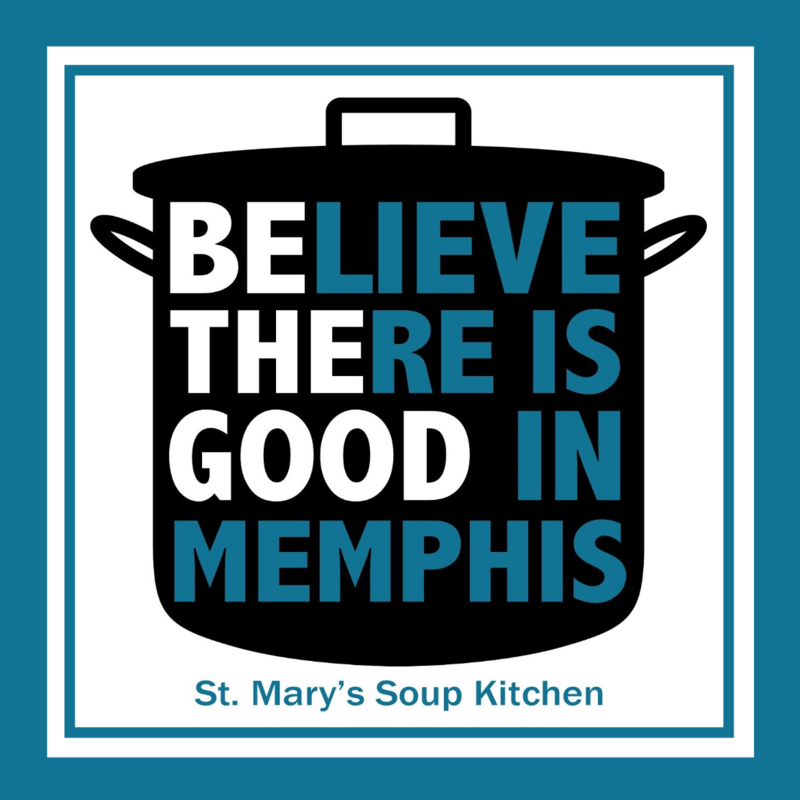 Memphis just needs more organizations to step up and take part- something that can happen if we all spread the word. I mentioned several ways to get involved in a previous post. (I'll list them again below.) One thing I forgot to mention is that even sharing this post, sharing pictures, or sharing information from RITI goes a long way! What is this social media thing for, if not to make the world a better place? "What about everyone else, who has to sleep out in the cold?" I think it can be easy to get lost in the reality that we are serving only 13 people on one cold night of the week. Someone recently asked me, "Don't you feel like it is a futile effort, when only a small portion of the homeless population can be served?" Repeating this question to the group raised some eyebrows and evoked a peculiar remark. "Starfish!" I understood the reference. Janie Kathryn and I actually received the story for Christmas and I was happy to have a chance to share it. There once was a man walking along the beach, when he came upon a boy picking up starfish from the sand and throwing them back into the ocean. The man asked the boy, "What are you doing?" To which the boy replied, "I'm throwing them back, so they won't die." The man questioned the boy again, "Don't you realize there are many miles of beaches and many other starfish lying in the sand? You can't possibly make a difference." The boy smiled, threw another starfish and said, "I made a difference to that one." "I'll tell my friends about it and they'll tell their friends... "
That's the spirit! It's true, we may have only helped 13 people on one particular night, but we also made a difference in THIRTEEN lives, in only ONE night. A little perspective from a group of kids can go a long way. Pass it on! Perhaps, someone you tell will organize another RITI site and we'll just keep throwing starfish back into the ocean. Do you have a kid or teen who wants to join us? There are still a few spots left for our Month of Service Learning. You can sign up here. 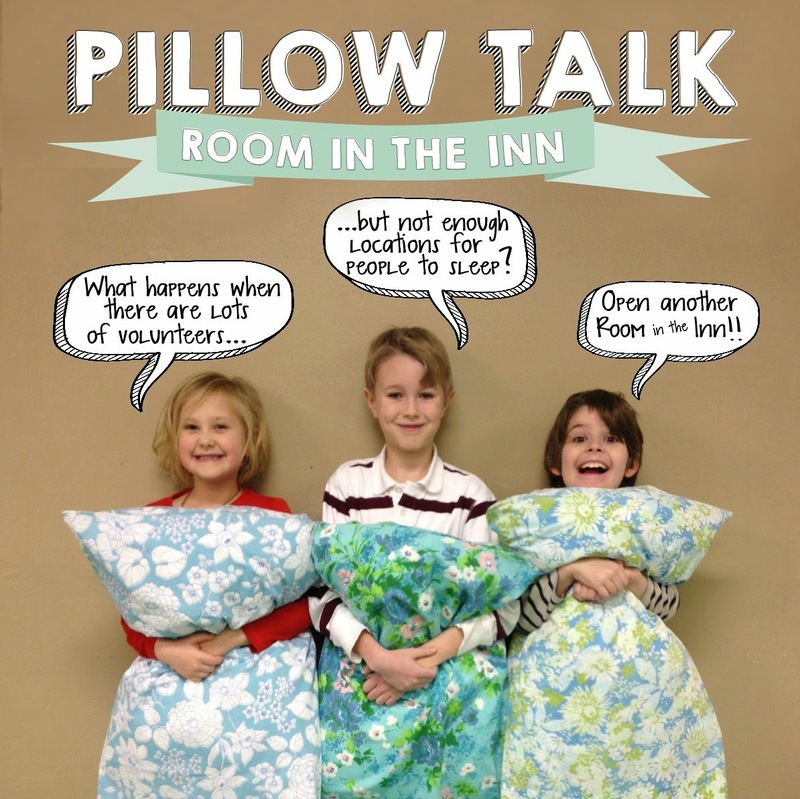 Interested in starting a new Room in the Inn site? You can contact the AMAZING Lisa Anderson here. Want to get involved, but don't have time? You can buy stuff! Here is a list of RITI needs that you can purchase from Amazon. You don't even have to get up from your computer! Want to stay updated on how you can help? 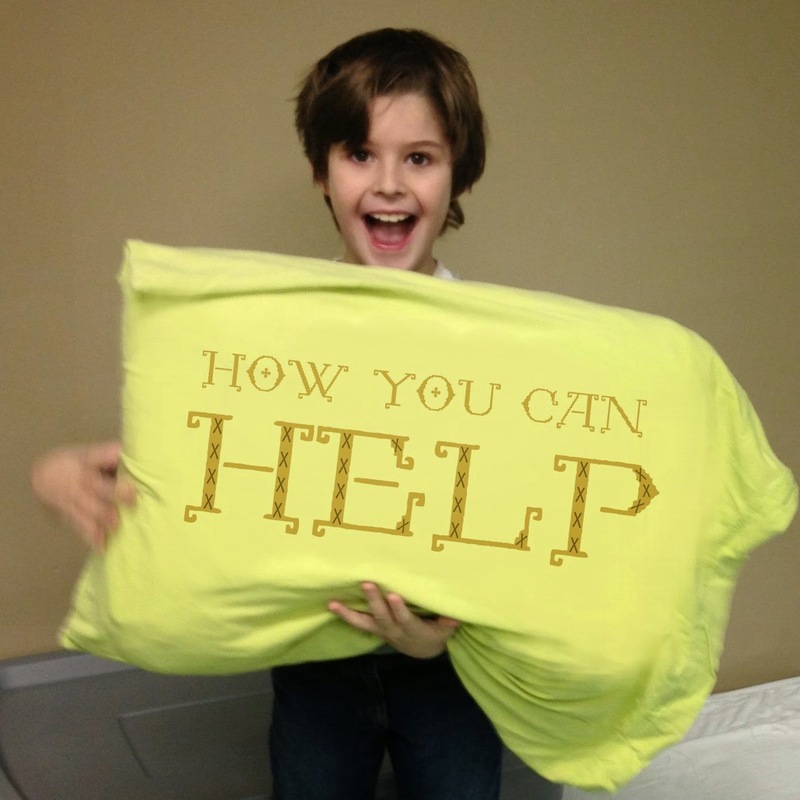 Join Friends of Room in the Inn Memphis on Facebook or follow RITI here. We kicked of 2015 with a month of service learning and we're doing just that... serving and learning. This month-long community service project is a little different than our usual volunteer activities, where Janie Kathryn is often the only kid. 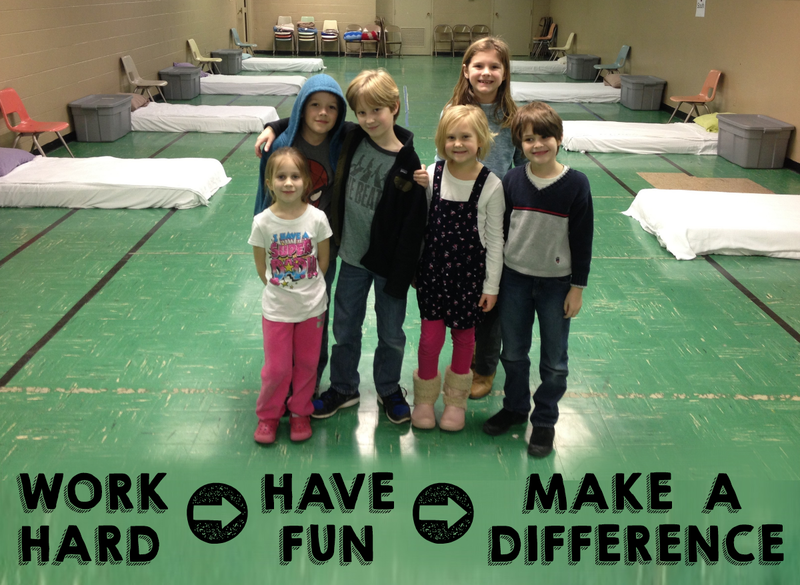 All throughout January 2015, we're volunteering with a group of kids. If our first week of service is any indication, we're going to have some fun and learn a lot from this experience! All of the service the projects focus on addressing homelessness, with a goal of making new friends and introducing participants to a few ways that kids can help in the community. Parents are often surprised by how many opportunities there are for kids to actively volunteer- something I might not have known, if not for our 2013 Volunteer Odyssey. 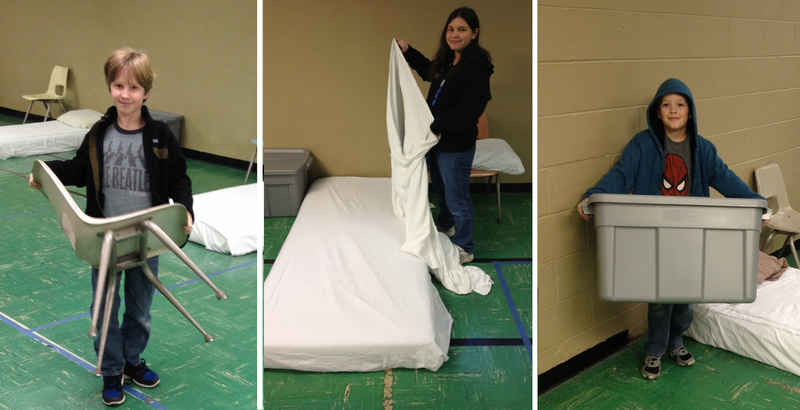 One of our projects this week was preparing the sleeping quarters for Room in the Inn - Memphis (RITI). Our team was made up of 8 volunteers, ages 6 though 13. I admit that I was a bit nervous about how it would go, knowing that if it was too much of a challenge, we might lose volunteers or not fill the remaining spots. To say it went well is an understatement! These kids worked hard! We took some time out of our work to talk about who we were helping and what it might be like for guests of RITI without congregations like Trinity United Methodist, who create shelters during the coldest months of the year. The team didn't just learn about volunteering and supporting our homeless community, they also learned a little bit about teamwork and cooperation (even if they didn't realize it). 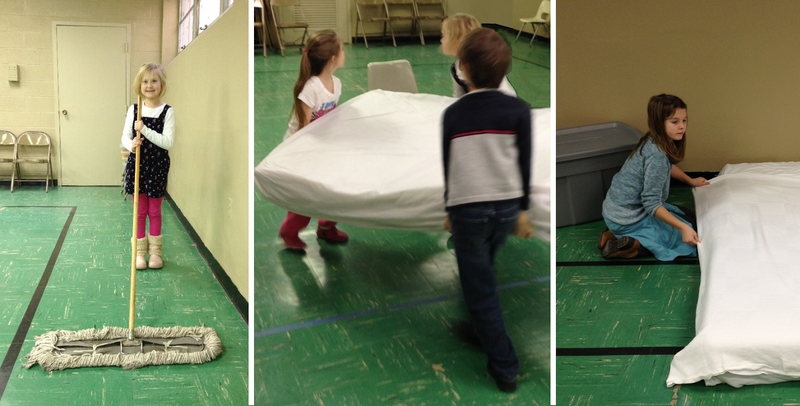 They worked together to carry and arrange mattresses and quickly discovered how much easier bed-making can be when you have a partner. Even our youngest volunteers eagerly collaborated to share tasks like sweeping. This team made friends and beds like nobody's business!